"Most people think you have to take the 'wild' taste out of deer. But really you can keep that good 'game' flavor by using a variety of herbs and spices." Slice venison roast into thick 1 inch steaks. In a saucepan, combine water, chicken broth, olive oil, butter, garlic, and hot sauce; bring to a boil. Reduce heat, and stir in vinegar. Season with parsley, basil, rosemary, cumin, paprika, salt, and pepper. Simmer for 20 minutes, stirring regularly. Allow to cool. Pour cooled sauce over venison steaks, and marinate in the refrigerator for 3 to 4 hours, turning regularly. Preheat an outdoor grill for high heat and lightly oil grate. 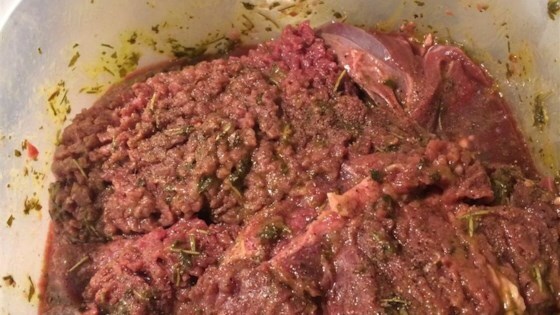 Take steaks out of marinade, reserve marinade. Grill steaks for 7 to 8 minutes per side, or to desired doneness. Turn them regularly and make sure you don't over-cook. Mop steaks with reserved marinade while cooking. Very good recipe- I liked it a lot. It did however erase ALL the gamey taste and that might be a problem for some. It still was delicious meat- just didn't really taste like deer anymore! A keeper for sure. Easy to make and served it over rice. Very good! Uses ingredients you already have on hand.